Any camera has a limitation in dynamic range. They cannot capture bright and dark parts of the scene if the difference in brightness is high enough. If there are a significantly dark and a significantly bright object in the scene at the same time, the camera would have to prioritize capturing one, and sacrificing the other. 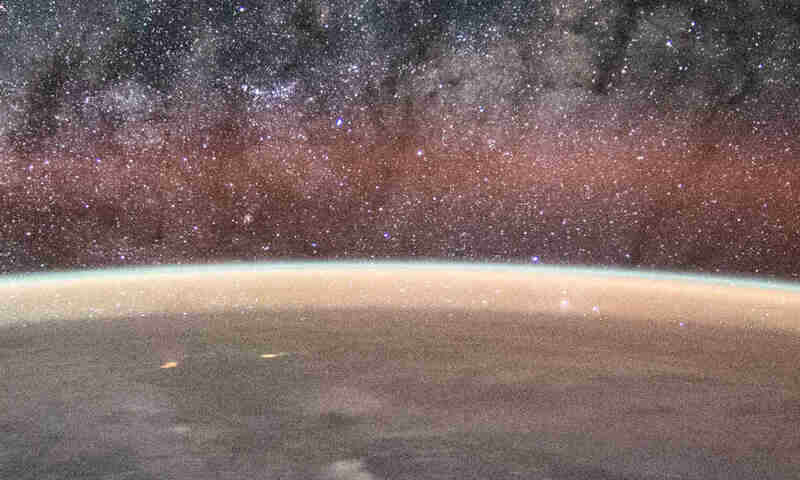 It can opt to capture the dark part, but the bright object will become too bright or overexposed, or it can capture the bright region, but the dark part will become too dark or underexposed. In the case of sunset, there are two different objects with contrasting intensity: the very bright sun, and the much darker terrain. The camera will have to prioritize one and sacrifice the other. If autoexposure is on, most cameras will evaluate the entire scene, and try to determine the optimal exposure to make most of the scene visible. In wide-angle setting (left), the sun is smaller, and the dark sea surface dominates the scene. Camera tried to balance the scene to make all objects in the frame as clear as possible and raised the exposure. As a result, the sun and the glare around it became too bright or overexposed. At this point, the sun is indistinguishable from most of the glare around it and gave the impression of being much larger than it is. When zoomed in, the sun occupies a more significant part of the frame, and brighter objects dominate the scene. Camera attempted to balance the scene by lowering exposure. As a result, sun glare is no longer overexposed, and the difference between the sun and sun glare becomes more pronounced. The camera can only guess what the photographer has in mind. In most cases, it can do the job adequately. But when it can’t, the photographer has the option to override it and use manual exposure. To get a clearly defined image of the sun disc, the photographer can use manual exposure. The resulting exposure would have been the same whether zoomed-in or not. 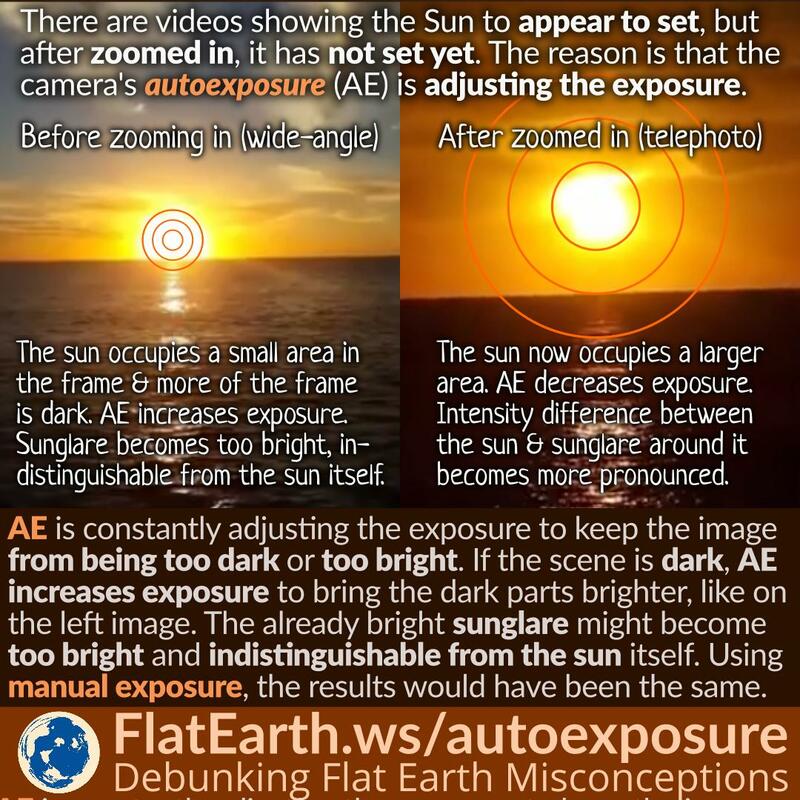 And last but not least, if the flat-Earther who took the video was willing to wait for another 10 minutes, the sun would have set below the horizon, and no amount of zooming can bring the sun back into view. The effect of autoexposure in such scene can be easily demonstrated using a camera/camcorder/phone camera with auto exposure on (by default it should be on). In a dark room, take a video of a light source, like a lamp, and change the zoom. The camera will adjust the exposure depending on the proportion of the scene is occupied by the light source. If the light source is bright enough, it can result in glare and could give the impression the light source is larger than it is.